Enrichment of existing Victorian cornices with addition of plaster panel mouldingsWilliam Wilson Architectural Mouldings Ltd can help if you have a period property with plaster mouldings in need of renovation or you're looking to reinstate or add period features to a home, business or historic building. With over 20 years experience, we have worked on everything from small Victorian terraced houses to Grade 1 listed buildings. We offer a full Plaster Moulding Restoration service and over the years have worked on Edwardian, Victorian, Regency, Georgian and earlier plasterwork, including private houses, churches, public buildings and even a castle or two. Using our high quality Handcrafted Plaster Mouldings we can reproduce or match any existing style, no matter how ornate. If you're looking to resinstate or add period features to a property we offer Bespoke Plaster Mouldings services and can advise on appropriate styles to create a unique design to suit your property and taste. 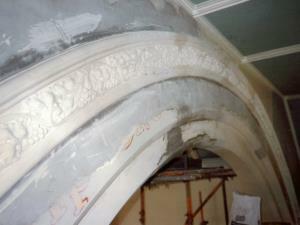 Restoration of decorative floral plaster mouldings in a Blackpool churchWe also stock a range of in-house produced plaster Centrepieces, Corbels, Cornices, Panel Mouldings and more to authentically recreate most period styles. 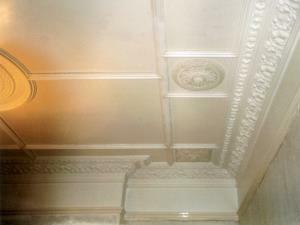 For examples of our Traditional Plaster Mouldings work, please take a look at the Photo Gallery page. We can supply, fit and restore traditional plaster mouldings to homes, businesses and historic buildings in: Accrington, Barrow, Blackburn, Blackpool, Bolton, Burnley, Bury, Carlisle, Chester, Chorley, Cumbria, Fleetwood, Garstang, Kendal, Lancaster, Leyland, Lytham St Annes, Morecambe, Oldham, Poulton-le-Fylde, Preston, Skelmersdale, Southport, Thornton-Cleveleys, Ulverston, Warrington, Widnes, Wigan, Wilmslow, Windermere, Wirral, and more!